Costa Rica (officially called the Republic of Costa Rica), is a country in Central America. It is bordered by Nicaragua to the north, Panama to the southeast, the Pacific Ocean to the west, and the Caribbean Sea to the east. The official language of Costa Rica is Spanish. The official currency is the colón. It has enjoyed a long period of peace since the 1948 civil war. Because of its natural beauty and political stability, it is nicknamed the "Switzerland of Latin America". Costa Rica has had no army since December 1, 1948. Instead of spending money on the military, the government spends money on education and health. 4,301,712 people live in Costa Rica. The capital city is San José. The current President is Luis Guillermo Solís. He was elected in 2014. During the colonial period, Costa Rica was the southernmost province of the Captaincy General of Guatemala. But it was operated as a largely autonomous region of the Spanish Empire. 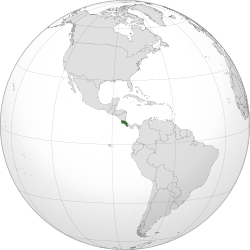 Costa Rica's distance from the capital in Guatemala, its legal prohibition to trade with the Viceroyalty of New Granada, and the lack of gold and silver made Costa Rica into a poor, little populated region of the Spanish Empire. Costa Rica was called "the poorest and most miserable Spanish colony in all America" by a Spanish governor in 1719. In 1824, the Costa Rican capital was moved to San José. This lead to a brief battle with the old capital, Cartago. Costa Rica is home to many plants and animals. The country has only about 0.25% of the world's landmass, but it has 5% of the world's biodiversity. Almost 25% of Costa Rica's land area is in national parks and protected areas, This is the largest percentage of protected areas in the world. Tortuguero National Park is home to spider, howler, and white-throat Capuchin monkeys. It is also the home of three-toed sloth and two-toed sloth. It has 320 species of birds. It has many reptiles. There is an annual nesting of the endangered green turtle, and is the most important nesting site for the species. Giant leatherback, hawksbill, and loggerhead turtles also nest here. ↑ Central Intelligence Agency (2011). "Costa Rica". The World Factbook. Langley, Virginia: Central Intelligence Agency. https://www.cia.gov/library/publications/the-world-factbook/geos/cs.html. Retrieved 2011-10-04. ↑ 3.0 3.1 3.2 Instituto Nacional de Estadísticas y Censos (INEC) (2011-12-20). "Costa Rica tiene 4 301 712 habitantes" (in Spanish). INEC, Costa Rica. http://www.inec.go.cr/Web/Home/Noticia.aspx?id=1. Retrieved 2011-12-20. ↑ 4.0 4.1 4.2 4.3 "Costa Rica". International Monetary Fund. http://www.imf.org/external/pubs/ft/weo/2012/01/weodata/weorept.aspx?pr.x=68&pr.y=11&sy=2009&ey=2012&scsm=1&ssd=1&sort=country&ds=.&br=1&c=238&s=NGDPD%2CNGDPDPC%2CPPPGDP%2CPPPPC%2CLP&grp=0&a=. Retrieved 2012-04-18. ↑ "Gini Index". World Bank. http://data.worldbank.org/indicator/SI.POV.GINI/. Retrieved 2011-03-02. ↑ UNDP Human Development Report 2011. "Table 1: Human Development Index and its components". UNDP. http://hdr.undp.org/en/media/HDR_2011_EN_Complete.pdf. Retrieved 2011-11-03. pp. 4, 42 (see Table 2.4 and Box 2.10) and 128. ↑ Shafer, D. Michael (1994). Winners and losers: how sectors shape the developmental prospects of states. Ithaca, N.Y.: Cornell University Press. ISBN 0-8014-8188-0 . ↑ "Costa Rica – Cartago". Costarica.com. 2009-05-22. http://www.costarica.com/Destinations/Cities-and-Towns/Cartago/. Retrieved 2010-06-26. ↑ "Blacks of Costa Rica". World Culture Encyclopedia. http://www.everyculture.com/Middle-America-Caribbean/Blacks-of-Costa-Rica.html. Retrieved 2007-11-23. ↑ Eggar, Marc. "Climate/Weather". http://www.worldheadquarters.com/cr/climate/. Retrieved 28 June 2011. ↑ Leo Hickman (2007-05-26). "Shades of green". London: The Guardian. http://www.guardian.co.uk/travel/2007/may/26/saturday.costarica. Retrieved 2008-06-08. ↑ "United Nations Framework Convention on Climate Change. "Issues relating to reducing emissions from deforestation in developing countries and recommendations on any further process"" (PDF). http://unfccc.int/resource/docs/2006/sbsta/eng/misc05.pdf. Retrieved 2010-06-26. ↑ Earth Trends (2003). "Biodiversity and Protected Areas – Costa Rica" (PDF). World Resources Institute. http://earthtrends.wri.org/pdf_library/country_profiles/bio_cou_188.pdf. Retrieved 2008-06-08. ↑ "Costa Rica National Parks and Reserves". World Headquarters. 2007. http://www.worldheadquarters.com/cr/protected_areas/. Retrieved 2008-06-08. ↑ Leonardo Coutinho and Otávio Cabral (2008-05-21). "O desafio da economia verde" (in Portuguese). Revista Veja. http://planetasustentavel.abril.com.br/noticia/desenvolvimento/conteudo_280147.shtml?func=2. Retrieved 2008-06-08. Published on website "Planeta Sustentável"
↑ "Diversity of Corcovado National Park". Govisitcostarica.com. http://www.govisitcostarica.com/region/city.asp?cID=350. Retrieved 2010-06-26. ↑ 26.0 26.1 Hunter, L. & Andrew, D. (2002). Watching Wildlife Central America. Lonely Planet. p. 97. ISBN 1-86450-034-4 . ↑ Cuarón, A.D., Morales, A., Shedden, A., Rodriguez-Luna, E. & de Grammont, P.C. (2008). Ateles geoffroyi. 2008 IUCN Red List of Threatened Species. IUCN 2008. Retrieved on 20 February 2009. ↑ 28.0 28.1 "Monteverde Cloud Forest Reserve". Govisitcostarica.com. http://www.govisitcostarica.com/region/city.asp?cID=402. Retrieved 2010-06-26. ↑ Garland, T., Jr. (1984). "Physiological correlates of locomotory performance in a lizard: an allometric approach". American Journal of Physiology 247 (5 Pt 2): R806–R815. PMID 6238543 . http://www.biology.ucr.edu/people/faculty/Garland/Garl1984.pdf. This page was last changed on 1 November 2014, at 01:28.